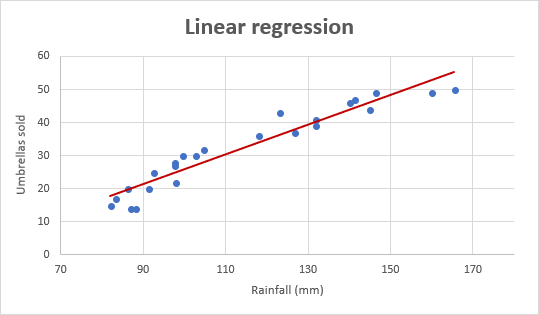 The tutorial explains the basics of regression analysis and shows a few different ways to do linear regression in Excel. Imagine this: you are provided with a whole lot of different data and are asked to predict next year's sales numbers for your company. You have discovered dozens, perhaps even hundreds, of factors that can possibly affect the numbers. But how do you know which ones are really important? Run regression analysis in Excel. It will give you an answer to this and many more questions: Which factors matter and which can be ignored? How closely are these factors related to each other? And how certain can you be about the predictions? Dependent variable (aka criterion variable) is the main factor you are trying to understand and predict. Independent variables (aka explanatory variables, or predictors) are the factors that might influence the dependent variable. Regression analysis helps you understand how the dependent variable changes when one of the independent variables varies and allows to mathematically determine which of those variables really has an impact. Technically, a regression analysis model is based on the sum of squares, which is a mathematical way to find the dispersion of data points. The goal of a model is to get the smallest possible sum of squares and draw a line that comes closest to the data. In statistics, they differentiate between a simple and multiple linear regression. Simple linear regression models the relationship between a dependent variable and one independent variables using a linear function. If you use two or more explanatory variables to predict the independent variable, you deal with multiple linear regression. If the dependent variables are modeled as a non-linear function because the data relationships do not follow a straight line, use nonlinear regression instead. The focus of this tutorial will be on a simple linear regression. x is an independent variable. y is a dependent variable. a is the Y-intercept, which is the expected mean value of y when all x variables are equal to 0. On a regression graph, it's the point where the line crosses the Y axis. b is the slope of a regression line, which is the rate of change for y as x changes. ε is the random error term, which is the difference between the actual value of a dependent variable and its predicted value. Below you will find the detailed instructions on using each method. 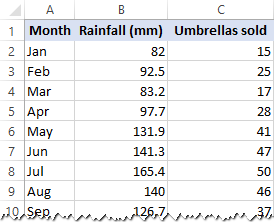 This example shows how to run regression in Excel by using a special tool included with the Analysis ToolPak add-in. In your Excel, click File > Options. 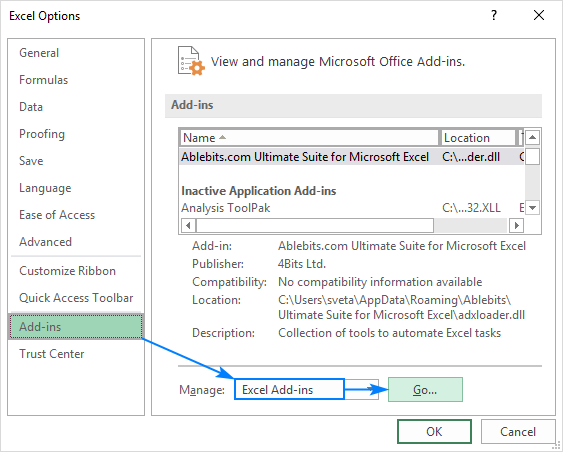 In the Excel Options dialog box, select Add-ins on the left sidebar, make sure Excel Add-ins is selected in the Manage box, and click Go. 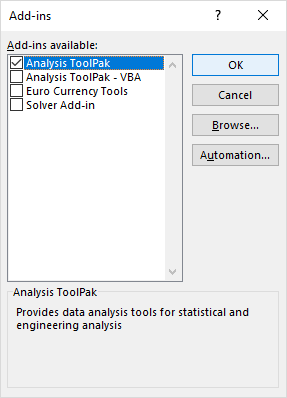 This will add the Data Analysis tools to the Data tab of your Excel ribbon. Select Regression and click OK. Select the Input Y Range, which is your dependent variable. In our case, it's umbrella sales (C1:C25). Select the Input X Range, i.e. your independent variable. In this example, it's the average monthly rainfall (B1:B25). If you are building a multiple regression model, select two or more adjacent columns with different independent variables. Check the Labels box if there are headers at the top of your X and Y ranges. Choose your preferred Output option, a new worksheet in our case. Optionally, select the Residuals checkbox to get the difference between the predicted and actual values. Click OK and observe the regression analysis output created by Excel. 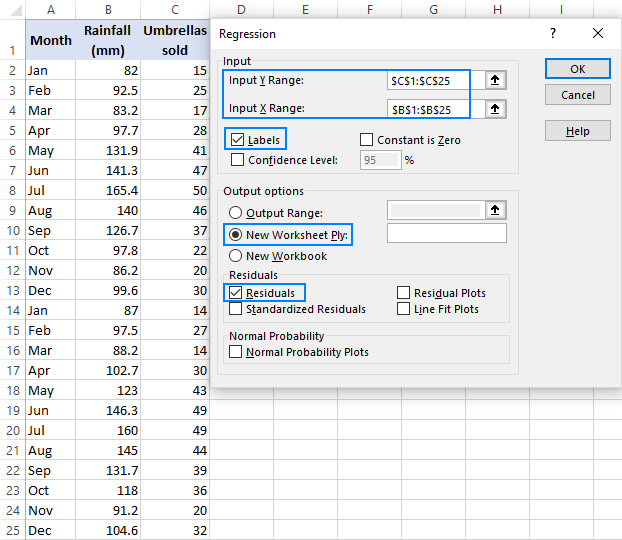 As you have just seen, running regression in Excel is easy because all calculations are preformed automatically. The interpretation of the results is a bit trickier because you need to know what is behind each number. 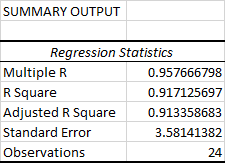 Below you will find a breakdown of 4 major parts of the regression analysis output. 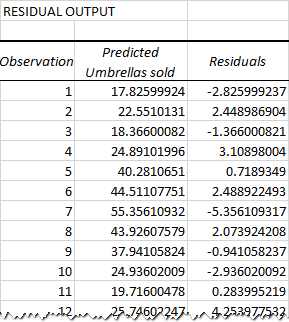 This part tells you how well the calculated linear regression equation fits your source data. R Square. It is the Coefficient of Determination, which is used as an indicator of the goodness of fit. It shows how many points fall on the regression line. The R2 value is calculated from the total sum of squares, more precisely, it is the sum of the squared deviations of the original data from the mean. In our example, R2 is 0.91 (rounded to 2 digits), which is a very good fit! It means that 91% of our values fit the regression analysis model. In other words, 91% of the dependent variables (y-values) are explained by the independent variables (x-values). Adjusted R Square. It is the R square adjusted for the number of independent variable in the model. You will want to use this value instead of R square for multiple regression analysis. Standard Error. It shows the precision of the regression analysis. The smaller the number, the more certain you can be about your regression equation. Observations. It is simply the number of observations in your model. df is the number of the degrees of freedom associated with the sources of variance. SS is the sum of squares. The smaller the Residual SS compared with the Total SS, the better your model fits the data. MS is the mean square. F is the F statistic, or F-test for the null hypothesis. It is used to test the overall significance of the model. 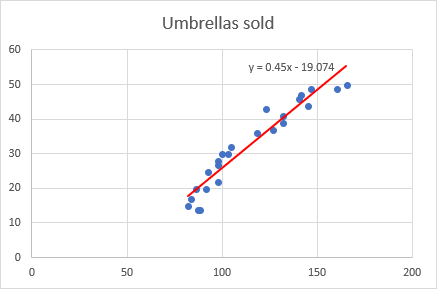 Significance F is the P-value of F.
The ANOVA part is rarely used for a simple linear regression analysis in Excel, but you should definitely have a close look at the last component. The Significance F value gives an idea of how reliable (statistically significant) your results are. If Significance F is less than 0.05 (5%), your model is OK. If it is greater than 0.05, you'd probably better choose another independent variable. 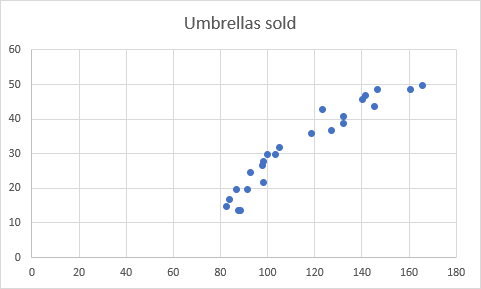 In a similar manner, you can find out how many umbrellas are going to be sold with any other monthly rainfall (x variable) you specify. For the first data point (rainfall of 82 mm), the residual is approximately -2.8. So, we add this number to the predicted value, and get the actual value: 17.8 - 2.8 = 15. Select the two columns with your data, including headers. Now, we need to draw the least squares regression line. 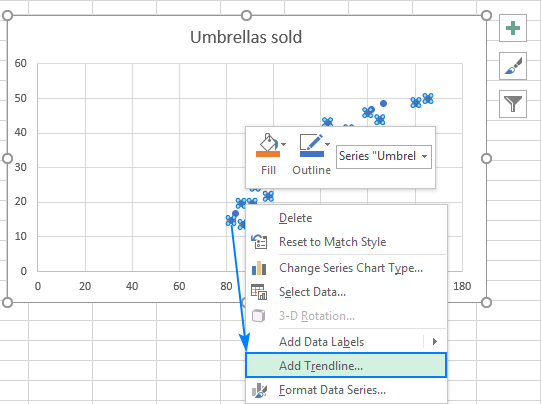 To have it done, right click on any point and choose Add Trendline… from the context menu. 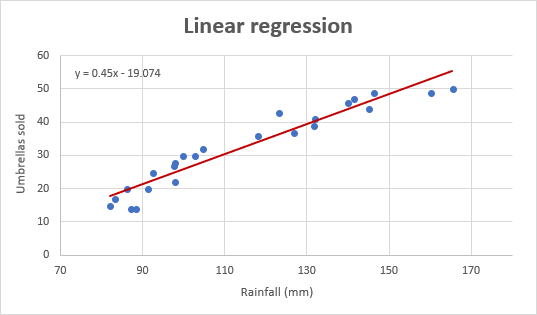 As you may notice, the regression equation Excel has created for us is the same as the linear regression formula we built based on the Coefficients output. Drag the equation wherever you see fit. Add axes titles (Chart Elements button > Axis Titles). If your data points start in the middle of the horizontal and/or vertical axis like in this example, you may want to get rid of the excessive white space. The following tip explains how to do this: Scale the chart axes to reduce white space. Important note! In the regression graph, the independent variable should always be on the X axis and the dependent variable on the Y axis. If your graph is plotted in the reverse order, swap the columns in your worksheet, and then draw the chart anew. If you are not allowed to rearrange the source data, then you can switch the X and Y axes directly in a chart. 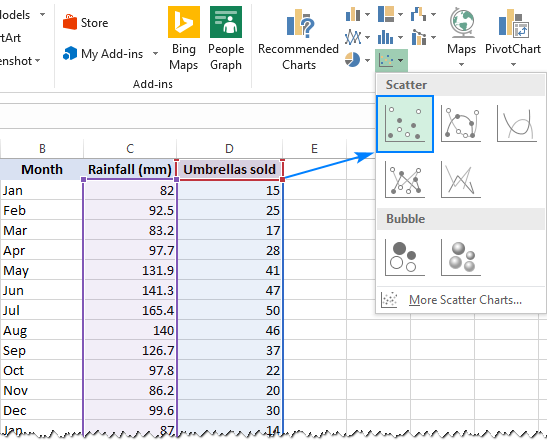 Microsoft Excel has a few statistical functions that can help you to do linear regression analysis such as LINEST, SLOPE, INTERCPET, and CORREL. Because the LINEST function returns an array of values, you must enter it as an array formula. Select two adjacent cells in the same row, E2:F2 in our case, type the formula, and press Ctrl + Shift + Enter to complete it. Tip. 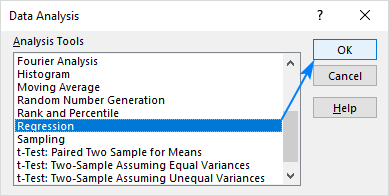 If you'd like to get additional statistics for your regression analysis, use the LINEST function with the stats parameter set to TRUE as shown in this example. 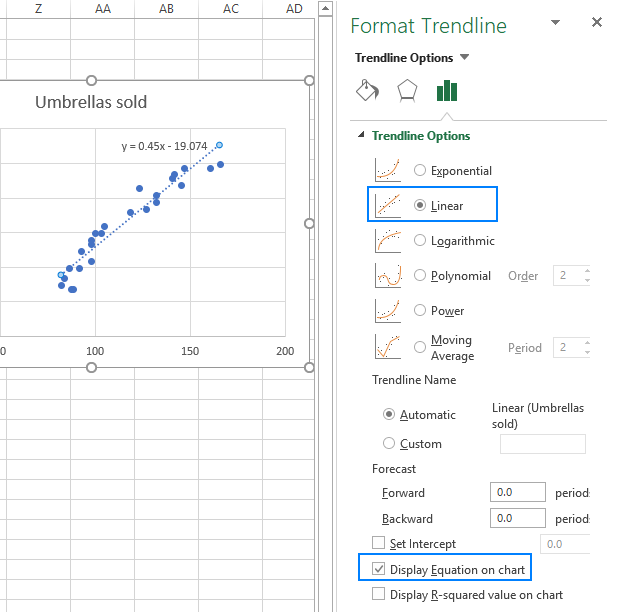 To have a closer look at our linear regression formulas and other techniques discussed in this tutorial, you are welcome to download our sample Regression Analysis in Excel workbook. That's how you do linear regression in Excel. That said, please keep in mind that Microsoft Excel is not a statistical program. If you need to perform regression analysis at the professional level, you may want to use targeted software such as XLSTAT, RegressIt, etc. 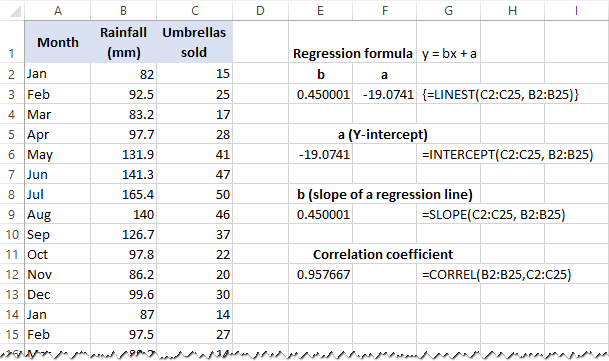 20 Responses to "Linear regression analysis in Excel"
Thanks! Good easy to follow guide. You can find all the source data in our Regression Analysis Sample Workbook. Thanks Ms.Svetlana for the quick response. Your tutorial was very easy to understand as it went step by step, hand holding a novice..which is very important..! I really appreciate your effort in making complex issues simple. Do you have similar tutorial on Multiple regression, Pricing optimization ,Price bundling etc( in Excel), Decision tree Analysis etc. Wow! Thank you. I had to learn this for my statistics homework. Why does # of observations equal # data points minus 1? It is not immediately apparent in your example because you include the title rows in your input ranges. I included the header row in the input ranges to make it easier to interpret the regression analysis output, based on the column headers. The number of observations equals the number of data points (24 observations, rows 2-25); the header row is not counted because the Labels box was selected. Your article is very nice and its self explanatory for beginners like me. Highly informative. I love that. God blesses you. that was really really helpful.